Just had chance to see the 2010 remake of a nightmare on elm street, so letting you know what I think of the film. Now I am a avid fan of the original elm st films, I loved the original films as a kid, I was about 13 or 14 when seen the 1st film and even had posters of Freddy Krueger in my bedroom even a lifesize poster on my door, weird childhood I know LOL, But just loved the films and as the films went on liked the humour coming into the Freddy character. I also loved the TV Series “Freddy’s Nightmare” which i think ran for just over 40 episodes. The film compared to the original first film does have a slightly different story line, but does keep some of the original character names and some of the original good scenes are still there, for anyone that knows the original 1984 film will remember these few scenes, like the school hallway, Freddy pushing through the wall and Nancy in the bath, so in some respects they have tried to keep true to the original story, Jackie Earle Haley’s portrayal of Freddy Krueger is good but nowhere near as good as Robert Englund’s in my opinion. The look of Freddy doesn’t seem as good also, sometimes does look fake. The slightly new story line does go into a bit more detail about Freddy’s past and what happened in this new story. The film does still seem to have the suspense of the original and does still keep you on your edge of your seat. The one good thing in my opinion is that the makers haven’t over done the gore factor, as with new horror films nowadays seem just to be about the gore factor, and I’m not keen on just a film full of gore. Now the film in its own rights, For anyone that hasn’t seem the original and doesn’t know the story of Freddy Krueger, it does have a good storyline and has the suspense of a good film. the film does start well and gets you to know the characters. 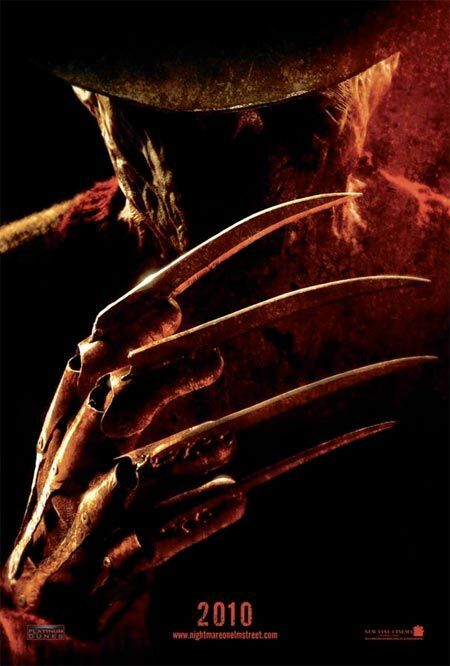 The story revolves around several teenagers having dreams about Freddy Krueger a man who is burnt and wheres a green and red sweater, he has a special glove with knives as fingers, Freddy is trying to kill them in their dreams. You find out about why Freddy is targeting these kids and the story behind why he is in their dreams. The film does go a bit slow at times but does have a few jumpy moments. I think if I was seeing this film as just a new film would probably only give it a medium rating, as there have been a lot of better horror films in recent years. So my final opinion of the film compared to the original don’t think is anywhere near as good, but that is coming from a fan of the films for over 25yrs, But I still did enjoy the film, The makers could have made it better but like all remakes of either film or TV shows they try to do more but sometimes that makes it worse. I would recommend going to see the film at the cinema if there is nothing else good on, but you maybe best to wait until it is on DVD.